Q. You were very close to a perfect match with two good sets, then a loss of concentration at 5 1. RAFAEL NADAL: If you see the match, conditions are there when we started the match were a little tough, then it was a little bit better. My feeling was I played a solid first set without do nothing special, but with no mistakes and trying to make him you know, to put him not in easy positions to attack the ball. And with the wind, put the ball inside, is not a negative thing. My feeling in second set, to be 5 1, I played these points well. I think Jo started the second set playing very bad with a lot of mistakes, more than usual. When you are 5 1 and you feel that you didn't play a lot to be in that position, when the opponent feels that he's already lost, you know, he started to hit every ball, he passed playing very bad to play very well. So after not winning the 5 1, not the 5 2 the 5 2 I played a great game. I only played one bad point with deuce, and I had easy mistake with my forehand. For the rest, he served well, great. When you feel in the position that you are 5 3 after having the match completely under control and you feel the opponent start to play much better, he play aggressive, I play a bit shorter, is true, but all the balls in the last hour of the match I was winning, I start to lose all that balls because his shots start to be much more aggressive at that moment. Q. How did you feel your game today compared to yesterday? Do you feel your finding your best rhythm? RAFAEL NADAL: No (smiling). I think I played great yesterday, the first set. Better than I did today, the first set of yesterday. Today the conditions were completely different. Is true that for me is better if we see a little bit more the sunshine. Important thing, I am in the final. Is great for me to be in the final. Is fantastic new, playing five tournaments in a row after injury, being in five finals in a row is great. Very happy for everything. We'll see tomorrow. Will be very tough. Q. Are you happy to play against Djokovic again? RAFAEL NADAL: No. I am not this kind of players that they are stupid and say, No, I want to play against the best. No, I don't want. I want to play against another opponent that is easier (smiling). I play against Djokovic, so I going to try my best to play my best match and try to give me a chance to win the final. But is not the perfect opponent. Q. Last 10 matches against him have all been finals. You won the last three. He won the seven before that. Is it still a special feeling playing against him? RAFAEL NADAL: If you don't feel a special feeling when you are playing the final of Monte Carlo, first thing is better you come back home and you play golf and fishing. That's the first thing, no? Then today I am No. 5 of the world, defending a lot of points in the next few months. The normal thing is still going a little bit behind on the ranking. But we played lot of important matches when we were 1 against 2, 2 against 3. Always is special play against a player like him. He brings you to the limit of your game if you want to have chances to win. I know I have to play better than what I did today and yesterday to try to win tomorrow. I have to play more aggressive. I gonna try. I don't know. I think is great after lot of time being outside of the courts, be back and play another time these kind of matches like I did in finals of Acapulco, last three rounds of Indian Wells, and now here. These kind of matches are special all the time. I am very happy to have the chance to play these kind of matches another time. Q. How much have you watched of Novak's matches this week? RAFAEL NADAL: Not much. I watch little bit against Youzhny the first day, first set, little bit against Monaco that's it. Yesterday and today I didn't watch. Q. In the past years Federer/Nadal was the biggest rivalry. Last year since you were injured, Federer was 30, so on, they started to say Murray/Djokovic could be the new rivalry. Do you see yourself putting up a rivalry with you and Djokovic as good as the one you had with Federer or it's impossible that can happen? RAFAEL NADAL: The only people that can say that are the fans, are the people from outside tennis. Because the rivalries, these classic matches, became classic matches because the people likes. We can ask the people if he likes the same when I am playing against Djokovic or I am playing against Federer. But is something have to say the people from outside. Q. Do you think the emotions tomorrow will be just a little different because you, as you said earlier this week, are finding your way a little bit after your comeback, and he's been troubled with his ankle, and he's finding his way a little bit? Do you think it will be a slightly more cagey match tomorrow? RAFAEL NADAL: I think it's no comparation [sic] between him and me. He stop for, what, few days for his ankle? Is not comparation [sic]. Q. I am not saying it's a comparison necessarily. He's talked all week about struggling with his movement. You talked about not feeling your game is quite there yet. RAFAEL NADAL: I need time. I need time. I cannot say nothing about him because I don't know him, his conditions. But talk about me, I know I need time to be 100% fit. I'm talking about physical performance, to don't feel this physical problems in some parts of my body when I'm playing matches every day. That takes time. That's what I think. Q. What is the key when playing Djokovic on clay or anywhere? RAFAEL NADAL: Play great. To win these kind of matches, always the key is play a fantastic match. We can talk about tactics, yes. But the only thing that really makes you win is play fantastic match. That's simple. The sport sometimes is not that complicate. Q. You played Djokovic 15 times in finals. Which is for you the most memorable of these finals? Q. The most memorable, what you remember best. RAFAEL NADAL: Oh, final of Australia was great. RAFAEL NADAL: That's sport. I can win, I can lose. You ask me what's memorable for me or what's memorable for the match? I answered you what I really feel was memorable (smiling). I think the final of Australian Open, six hours, I think it's memorable. Memorable for me was all the times was when I winned [sic]. For sure, final of Roland Garros last year was special for me after losing three Grand Slams in a row against him. The final here and Rome last year were very important. For me, I felt that I was fighting and trying to find solutions all the time for doing almost one year and a half to try to change the dynamic that happened I think in 2011 against him. So finally when you fight for something, you work hard for something, finally you do, that's the more emotional thing. Trophies, victories, titles are very important for one reason, that's why all the players, we are here to try to win. But then what really makes me happy in my case is see that I am improving all the time and I am able to improve myself all the time and to change dynamics like I changed last year. Today is a different history, different year. All of that forgetted when you are outside. But I happy to play against him another time. Is a test for me at the same time to see how I am, especially if I am feeling, you know, healthy tomorrow and competitive. Is going to be great to play against a player like him. We'll see. Q. He came out so strong. He's won games against you before, but when he started that strongly, how did you feel? RAFAEL NADAL: I think even if is true that he started very strong, my feeling was 4 0 was too much. I had very good chances to win the second game. Then I had a tough game, the third one. Then I had 30 Love with my serve another time. So all of this at the end he was playing great, yes, but I was feeling that I was not playing bad. These kind of matches, 2 All can be possible. So is not something that you start and you don't feel the ball, the opponent is winning every point. No, that was not my feeling this afternoon. Is true that he was playing great, probably better than me, but not that different. If you are there 3 1, you are inside the set. 4 0 is too much, no? That's what happened. I think he played a little bit better than me, especially in the first set. I didn't had that feeling in the second. I had 15 40, then I had the break, then 4 2, 6 5. I felt that I was playing really well the second set and I was having more chances than him. But I need a little bit more physical performance. That's the real thing, to play all that points with the same intensity. I get tired more to play with that intensity, earlier than what I used to do it. So, yeah, even like this I had the chance to win the set. But I get tired in the 4 2. Then to win 5 All, have the break, was a few very intense points. I get tired to play the 6 5. I didn't play with that intensity. When you start to have that feeling, is tough. Q. I know you say that you felt you were not the favorite with the time you had spent out of the game. But does it hurt to finally lose here after so long? RAFAEL NADAL: Hurt or not hurt, I don't know. I like to win more than lose, but that's sport. Is not a tragedy. I lost after eight years without losing here. That's something. That's the more normal thing that can happen after all the success that I had here. I think for me it was a positive week. That's the thing. Was a really positive week for me. I didn't have the practice in Mallorca, I just practiced here before the tournament. With not much preparation, I was able to play in the finals, a few matches. This week going to help me be fit for the next weeks. Hopefully I can play another great week in Barcelona next week, play some matches that will keep helping to put me in the 100% condition physically talking. If we talk about tennis, I was pleased about my tennis this afternoon. So that's all, no? I think I'm in the right way. Five finals in a row. If you tell me that four months before, I will be crying for emotions, no? Just very happy to be able to play against the best players of the world another time, and play with real chances. That's very, very important for me and is fantastic new. I feel emotions about that. Q. Will you have enough time between now and Roland Garros to get the energy levels up to what you need to retain the title? RAFAEL NADAL: I play Barcelona. That's my schedule. Roland Garros is very far. I will try my best now to play a very good week in Barcelona. Is a tournament that I love. Roland Garros is there. We have Barcelona, then we have Madrid, then we have Rome. It's enough time, I think yes. It's more than enough. If I am keep doing as well as I did during all this week, why not? Q. The second set 4 2, chance to serve for the set at 6 5, was it just physical or were you nervous or was there something else? RAFAEL NADAL: Seriously, 2011 I felt against Novak a few times the tension. I feel a little bit anxious in some important moments. Was not the case today. I didn't felt that way this afternoon. I fighted to be back on the match after a tough first set. Is not only physical, but is mental too. But you know at the end is not easy to separate that, no. When you are bad mentally, you feel worse physically. But I really am not bad mentally today. Not in that moment I am bad mentally. I am fresh. I am enjoy to be on the tour another time. When you get tired physically, the mental part is very difficult to maintain there. Even like this, I tried hard, I tried hard for moments to put one more ball inside. When that happened, I really didn't feel that I was far to have the chance to win a match against him. Today he was better than me. I just can congratulate him and his team. I really hope that I will have another chance. Q. It's a little bit strange. You won on hard court and Novak Djokovic lost. Today you lost on clay and Djokovic won. How do you see that? RAFAEL NADAL: No, is not the first time that happen. Is not the first tournament I lost on clay. Indian Wells was not the first tournament I won on hard. The same for him. Is not his first victory on clay and is not his first lose on hard. That's tennis. Historically I played better than him on clay, little bit, yes. Historically he probably played better than me on hard, yes. But we were not one here and one there (indicating far apart). I don't know how many titles I won on hard and how many titles he won on clay. I think both of us, we are complete players and we can play on every surface. Win or lose, we were in the finals both. Q. When you were one break up, you lost your serve 4 3 at 15. When you were 6 5, you lost your set to love. Then on the three points of the tiebreaker, you lost three out of four. Do you think the serve also wasn't helping you enough maybe in terms of percentage? I'm asking, in these moments was the serve somehow important? RAFAEL NADAL: Well, I felt better today from the back. That's the real things. But I was able to serve faster today, this afternoon. I really served much better than what I did the previous days. Yesterday I had an average 150 something. Today was higher. That's a positive thing. I felt better. The treatment worked well. I feel more, you know, healthy this afternoon from the back than what I felt the last two days. So that's a positive thing. But in general I am playing against probably the best returner of the world. So was not the question of the serve. The serve can give me some points. But when I'm losing these points in a row, it's because something goes wrong from the baseline, not from the serve, no. That's my feeling. Serve can help me more, yes. But was not the fault today. Q. Can you explain what you still feel is difficult in Djokovic's game regarding your game, what are the issues when you're facing him? 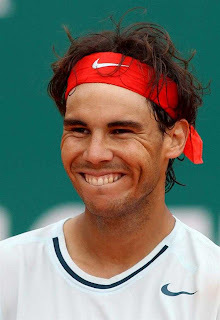 RAFAEL NADAL: Which ranking is him (smiling)? Q. In some player's game you have something that is more difficult than other ones. RAFAEL NADAL: Yeah, but I am playing against best player of the world. He's a fantastic player. If you are not at your 100%, is very difficult to win against these kind of players. That's all. His game is great. His game is very complete. To win, I have to play my best and I have to bring him to the limit. When I was in my 100% in the past, probably he had the same feeling. But that's the sport. That's the good thing about the sport. Bring your tennis or your body to the limit to do a bit more and win these kind of matches. These kind of matches are special ones. To win against players like Novak, if you are not at your 100% full, is almost impossible. Q. You had the breaks in the second set, but he returned really well. Is it disappointing to lose, because you did play well the second set, that makes it more disappointing to lose because it could have gone to a third set and been a different ballgame? RAFAEL NADAL: No, no. Was more disappointing if I was losing 6 2, 6 2. That's the real thing. Was disappointing? Yes. I don't like to lose, I say before. But for me certainly it was a very positive week. Nothing to say. I feel for moments in the second set I played my best tennis of the week. So that's important thing. When I was doing that, I wasn't far of him, even if I was playing in the right way to win. I needed a little bit more. I needed more physical performance. I needed more matches to play with this intensity all the time. I need to be completely focused in every moment. That gives you the competition, gives you this special things, extra things, when you are playing against some players maybe you don't need sometimes. But to play against Novak, to play against few players, you will need, and I need. I going to work on that.